This entry was posted on Tuesday, August 26th, 2014 at 8:59 pm	and is filed under Win-It-Wednesday. You can follow any responses to this entry through the RSS 2.0 feed. You can leave a response, or trackback from your own site. The one thing I will miss about summer is hanging out by my friends pool having great BBQ’s and fun! I am the new BBQ Queen, !!!!!! My boyfriend has been teaching me all summer how to grill anything, even meat, I am vegan. So far I have mastered the grilled peppers and I am the master at eggs and bacon….yes, breakfast on the grill, who knew? One thing I am going to miss from summer is the chance to have parents drive me from place to place to visit friends and family and have great fun! with my medical conditions I cannot do driving and it is now back to work for everyone, including me full time at daycare, which I also love with the smiles and laughter of children of all ages. I am going to miss summer nights sitting on my porch with my glass of wine. Fall is my favorite season. And I make my BBQ in the crockpot so that is a year round thing for me. I am going to miss being able to do the out door cooking. But I am looking forward to the cooler nights when I get to start cooking all the comfort foods that come with winter. The fall is my favorite time of the year. I am looking forward to apple cider, sweet apples and barbequing when the air is a little crisp. I will miss the long days of summer! I hate when I leave work and it is already getting dark! I’m excited for the delicious caramel apples a local pumpkin patch have! I lost a very good friend to lung cancer this summer, he will be missed. I’m glad fall is coming, I all so go to college and am also 66 young. I have a degree in Fashion, cooking and I’m now going for my degree in floral design. College has given me a new out look on life, and I enjoy it. The end of September means the end of scallop season in Florida. I will miss scalloping, but the slightly cooler weather of fall will be a welcome relief to the oppressive heat of summer. I love fall with the cooler air, changing leaves and sitting on my porch with my dog Duke. I miss the summer weather, the lot of sunshine. I will miss sitting on our patio and the BBQ. The thing I am most excited about is cooler weather so I can do more outdoor activity! Will miss my walks with hubby with out Nordic walking poles. We do walk much of the rest of the year, but it’s not as pleasant! Just the Sun, walking outside with socks shoes or a coat. Just the Sun, walking outside with socks shoes or a coat. The fires at night, looking at the stars, camping.. tubing, fishing.. etc. 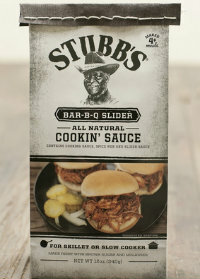 I just had Stubb’s at a midweek BBQ on Tuesday! Yummy and gluten free, it was the key to my enjoyment of some awesome ribs! I BBQ all the way through fall, so I’ll be looking forward to more ribs and more Stubb’s. I am looking forward to fall, with the cool crisp air and the beautiful changing colors of the trees. I miss the nice picnics and outdoor concerts in summer. I look forward to the fall. It is a very rainy week-end and boy does it look fall. Winter is coming. Another rainy day. When will the sun come out so I can use my BBQ. I actually am looking forward to raking leaves! I am going the miss the warm days. We had a super rough winter last year here in MI. One thing I am looking forward to this fall season is the Peanut festival! Get to pull out the hoodies and watch the leaves change colors and feel the cooler air. I’m all excited now. Haha. Summer’s outdoor Farmer’s Markets will be closing soon, and I will dearly miss them. The fresh-from-the- garden fruits and vegetables are delicious out of hand or for grillling! I love the way fall smells – it is my favorite season. The leaves put on a show. I will miss being able to swim in our neighbors pool to get my exercise in! Cookouts are more enjoyable in the fall when it is not quite so hot. Since I’m usually the one over the grill, cooler weather makes it much more pleasant! Finally a sunny day. Time for the out doors and BBQ. Looking forward to the best time to BBQ, fall. Cool weather, beautiful fall colors, apple picking and BBQ baby back ribs. One thing I will miss about summer are the long days full of sunlight. I will miss watching the fireflies light up my backyard! My favorite thing about fall is getting to know a new group of precious preschoolers in my classes. I will miss the opportunity for little getaways. When the kids are off school we can just take off for a day to two whenever we can get away from work. During the school year we don’t have that flexibility. Cooler fall days mean a more pleasant time at the barbeque grill, slathering on that Stubb’s sauce on the meat of the day! Fall! Fall is when unbearable humidity abates, and when the trees drop thousands of new fun toys for the cat to be playful-as-a-kitten with. Summer came late here, will miss my grill. It did not get as much of a work out as I would have liked. Rainy and very humide day when will the sun come out again so that we can have some more BBQ. Summer nights sitting out on my front porch with my husband having a beer! I will miss staying up late, sleeping in late, and having my day to craft my heart out. Now it’s back to work at school! nights are getting colder perfect time to eat BBQ. I will miss the long (24 hours) warm days of summer, but I do look forward to the beautiful blanket of snow; we are having fall right now. It’s time to get out the crock pot and slow cook the ribs in my favorite sauce; Stubbs. I miss BBQ when summer is over. Great sunny day today great night for sitting on balcony with my glass of wine. I love Bar-B-Que sauce on year round! And I”m looking forward to fall…it’s that crispness to the air in the morning, the changing colors, and cool evening breeze coming in the bedroom window. Oh yeah! I’m ready for fall to start arriving! Looking forward to getting out the cool weather clothes and boots. I like to start getting ready for the holidays early, too. Fall is my favorite time of year. Chili in the crock pot, baked apples, spaghetti squash, everything pumpkin, pulled pork crock pot style, roasted turkey, butternut squash. All my favorite things. I am so happy fall is on it’s way. Last evening a very cool night so opened my patio door, built a fire and had a glass of wine. What a way to relax.